Sometimes the word “love” is used too loosely. I love iced coffee, tequila and Game of Thrones. I love beautiful shoes and a well-made handbag. I love a clean kitchen and when people are on time. Yet are these really things to love? I love my babies, my husband and friends that make me laugh out loud. In my opinion, to define a true or real love would be something or someone I could never live without. Therefore, maybe I do love iced coffee and fancy purses way more than I should. In its initial stage, what triggers us to fall in love with a person, idea or a thing? What causes attraction? Generally, I might see or hear something and it causes a spark of interest or even goosebumps. It could be someone I’ve met that I find very intriguing: Perhaps it is the lingering thought of a pair of velvet pumps I saw in the boutique, or me craving an iced coffee from French Truck Coffee. The emotion is not easily conveyed; it’s an indescribable feeling about someone or somethings that refuse to escape my thoughts. Every fashion savvy follower yearns for fall and most cannot help but fall madly and deeply in love. Fall has always been the most desirable season in fashion; it is fashion at its best. The fabrics are lush and fashion magazines look like an edition of War and Peace. Cooler temperatures allow us to play with layers of outerwear and heavier rich textures. One of the most revered boutiques in New Orleans, and now well beyond NOLA’s environs, Em’s Boutique on Metairie Road, has given us everything we crave, desire and covet every single fall season for more than 12 years. The retail market and the economy have been fickle over the past decade, and boutiques have come and gone — blaming the rising costs of leases and on-line shopping. Em’s however has figured out a way to adapt and thrive. “Styles and seasons change; you move with that change or you get left in the dust,” Sanchez says. 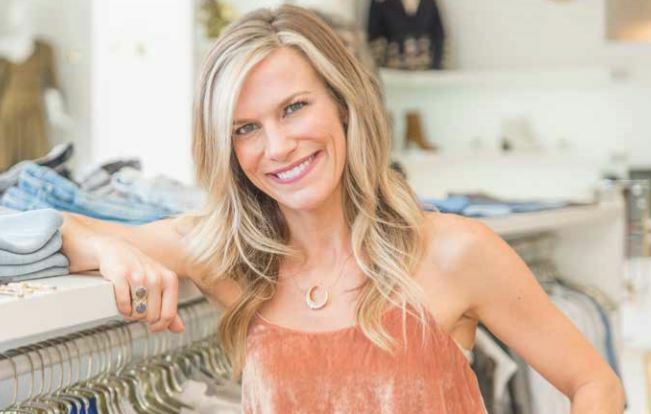 “@shopems on Instagram has been a major tool for growth; we are able to reach more people, expand our buying.” The boutique ships Instagram orders all over the country and has become a destination shop for visitors from out of town. With the assistance of the style savvy shop girls at Em’s, Brooke Dwyer and Wiley Lewis, we have come up with your fall shopping wardrobe essentials. 1. Look for rich hues like marigold, chocolate brown, blush and power reds. 2. Embrace the glitter bootie. 3. Built-for-speed shoes such as loafers, mules and slides. 4. Denim with interesting frayed details like a raw asymmetrical hem or ruffle. 5. Find a flattering midi-skirt. 6. Consider dresses with large vintage-inspired floral prints. 7. Try a fish-net tight with your new boots. 8. Attempt the one exposed shoulder blouse — it’s appropriate for any age. 9. Buy a wide belt to place over a dress or jacket. 10. Velvet anything … shoes, bags, tops and skirts! Em’s makes it easy to fall in love and effortlessly fill your closet with your heart’s desires. previous Get a Leg Up!